Posted by Bill Mann on Tuesday, December 18th, 2012 at 11:40am. In its Q3 2012 report, RealtyTrac says that 193,059 homes in some stage of foreclosure were sold, accounting for 19% of all residential home sales. In addition, pre-foreclosure sales -- also known as "short sales" -- climbed 22% on a year-over-year basis. The average price of a short sale home fell by 5 percent as compared to a year ago which may reflect an eagerness on the part of mortgage lenders to dispose of distressed properties before they fall into foreclosure. Foreclosures can increase a lender's losses, and foreclosed properties be expensive to manage. For homebuyers in Coastal Delaware, the banking industry's shift toward short sales is welcome news. It's not just the higher home sale prices that have pushing banks to settle on short sales, either. 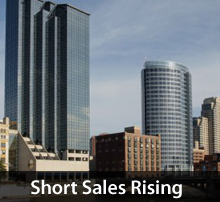 Short sales are less costly, too. Foreclosing on a home requires banks to pay court costs, among other fees, and which positions the short sale outcome as a clear winner for many banks. Buying a short sale has been a notoriously slow process with a lack of defined timeline. As banks improve their distressed sales division, they're getting faster and more efficient. This makes it "easier" for a buyer to buy a home in short sale. However, don't buy a short sale without the help of an experienced, licensed real estate professional. The negotiation process is different for a short sale than with a "traditional" home purchase. Time lines are different, responsibilities are different, and purchase contract language may be different, too. The same is true for buying a foreclosure.